It’s no secret that I’m a cynophile. My parents have had pet dogs ever since I can remember, we’ve been donating to animal shelters or leaving out food in parks and side walks for years, and our two current pets were stray dogs we picked up directly from the streets. In every possible way for a canine, they are part of the family, including post-mortem, and are included in our New Year ceremony, when a prayer and offerings are made to Diana for their protection and well being. It’s also no secret that I add non-Latin gods to my religious life and practices, which is not without its historical precedent. If those deities have been Romanized at some point in time – including in modern times – I may integrate Them into my Roman cultus – including ceremonies to Latin gods; if not, I maintain a separate cult according to Their own traditions. So, for instance, in my New Year ceremony Ingui was honoured side-by-side with Jupiter, Mercury, Diana and others, receiving prayers and offerings in the same manner as Them. But I never mix Khnum with Latin deities in the same ceremony, since I haven’t Romanized Him (and have no plans of doing so). Once the Divine Potter of the Nile entered my religious life, back in 2011, I guess it was only a matter of time before a dog-headed god joined the festive calendar of a cynophile like me. So I eventually added Anubis to my pantheon and, after mentally working things out for a long time and giving Him offerings at irregular intervals, I finally decided on a yearly feast and celebrated it for the first time yesterday. 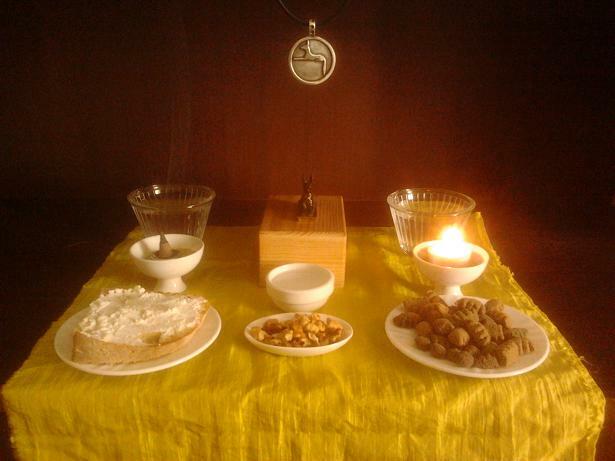 In the morning, I prepared a temporary shrine and offerings: a candle, incense, water, bread with cheese, walnuts, and dog biscuits. After washing my hands and face, I approached the shrine, bowed, and made an opening prayer. Then I presented and placed the offerings by the image, starting with the candle, and I also added two bowls of water to be blessed, stored and later poured on family graves between the 13th and 21th. Once the incense had burned out, I again bowed and one by one removed the food offerings from the shrine for consumption. Me and my dogs ate all with the exception of the biscuits: since Anubis is also a god of orphans and abandoned creatures – at least in modern times – I wanted to honour Him by sharing some of the offerings with abandoned animals. So I took the biscuits out and gave them to two stray dogs I found yesterday. There are a few more things I’d like to add to the Cinocefalia, but the ideas are still mentally maturing. For now, this seems to have been a pretty good first time, suitably integrated in the Roman year – which is, after all, part of my matrix – and hopefully enjoyable by the Dog-Headed God. Very cool. I’m especially glad to see that your offerings were disposed of charitably. Well part of them were and I guess I should be doing the same with the offerings to deities of wanderers, stray and abandoned people or animals. It adds to Wednesday’s devotional to Mercury, when I can leave coins or food on road sides.